Thermal transfer label ribbons are either coated side in (csi) or coated side out (cso). This is referring to the side of the ribbon that the ink sits on. The way to tell which side is coated is by unwinding the ribbon past the outer wrap. Once you reach the black ribbon, you will see that one side is shiny and one side has a more matte finish. The duller side is the side with the ink. This is the side that should face the labels when you put the thermal transfer ribbon on the ribbon spindle. Depending on the specific thermal transfer printer that you have, you will either use one or the other. 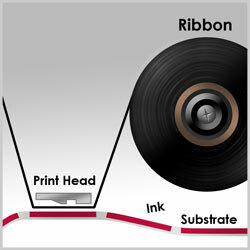 The only difference between an ink-in ribbon and and ink-out ribbon is the direction that the thermal ribbon is wound. Some printers require a CSI ribbon. Examples are Sato and Datamax printers. If your printer requires ribbon with coated side in, you will have to set up your ribbon similarly to the diagram on the right. Since the ink is coated on the inside of the ribbon, configure the ribbon so that it unrolls from the top. When it feeds around the print head, the ink will be facing the label. If you set this up backwards, the ink will be facing the print head instead of the labels, and the printing will not work. Other printers require a CSO ribbon. Examples are Intermec printers, Zebra printers, and some Datamax printers. If your printer requires ribbon with coated side out, set up your ribbon like the diagram on the right. Since the ink is coated on the outside of the ribbon, configure the ribbon so that it unrolls from the bottom. When it feeds around the print head, the ink will still be facing the label.